As part of the strategic planning process each year, ICANN seeks public comment to inform the development of the next version of its Strategic Plan. The 2012-2015 strategic planning process kicked-off in May and community input discussions were held prior to and during Singapore. Leadership also held workshops exploring strategic issues facing ICANN. The next step in the strategic planning process is to gain broad community input prior to the development of a 2012-2015 Strategic Plan that will be posted for comment in September 2011. As part of the strategic planning process each year, ICANN considers major internal and external events that have occurred since the last writing of the plan. The last plan was essentially completed in December 2010 and approved in February 2011. Since that time we have witnessed political and economic changes in the world scene, including continuing challenges confronting developing nations – an environment affected by continued and better access to the Internet and the benefits it can bring. Internal to ICANN, major events have also occurred. The New gTLD Program was approved by the Board after seven years of multi-stakeholder community policy development. The Affirmation of Commitment reviews (ATRT and others) continue providing ICANN with clear feedback on performance and solid recommendations for improvement. We also saw a change in Board leadership with Peter Dengate-Thrush stepping down and Steve Crocker assuming the mantle. Each year, significant external and internal events cause forces that continue impact and alter the strategic direction of ICANN. We are mindful of recent events and would ask you to consider them as well when you develop your public comment input for this year’s strategic plan. As we now turn our focus to the 2012-2015 Strategic Plan, ICANN seeks public comment to support the development of the new plan. A framework has been structured to assist in soliciting feedback. During a strategic planning process, it is normal for an organization to perform an assessment of the organization’s Strengths, Weaknesses, Opportunities and Threats (SWOT). This is commonly called a SWOT analysis. This year, we are inviting public comment to help complete ICANN’s SWOT analysis. 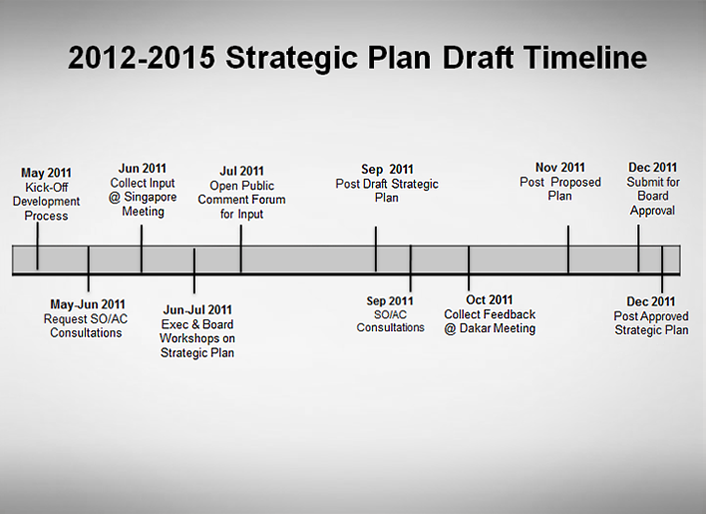 Your comments will be important input to assist ICANN in developing the DRAFT 2012 – 2015 Strategic Plan. ICANN leadership has done some preliminary SWOT work and identified key areas of interest where we would like to see candid public comment. Additionally, you are encouraged to also provide general comment on ICANN’s overall strengths, weaknesses, opportunities and threats. Each year the strategic planning process continues to build upon the prior year’s plan. Strategic plans do not normally include radical shifts in policy from one year to the next. However, old strategies need to be retired when achieved or outdated and new strategies introduced in response to new issues. There have been several changes in ICANN’s operating environment recently, among them: the adoption of ATRT recommendations, approval of the new gTLD policy implementation and the focus on adapting the organization to changes in the DNS, the delegation of IDNs, signing the root, automation of root-zone management processes, IPv4 exhaustion and upcoming RPKI deployment. These, along with newly identified needs, will shift ICANN’s strategic focus somewhat, resulting in changes to the strategic plan. 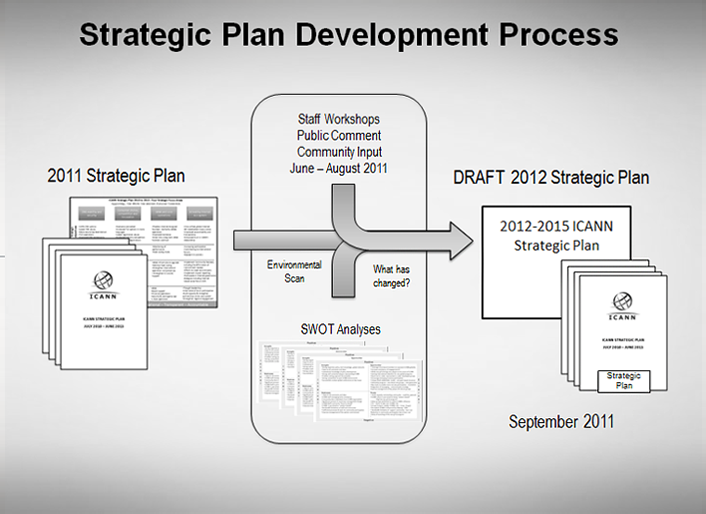 Please review the current 2011-2014 ICANN Strategic Plan [PDF, 3.37 MB] posted on the ICANN website. Undoubtedly there are other key areas, and you are encouraged to provide input if there is an area of interest that you feel needs to be addressed. 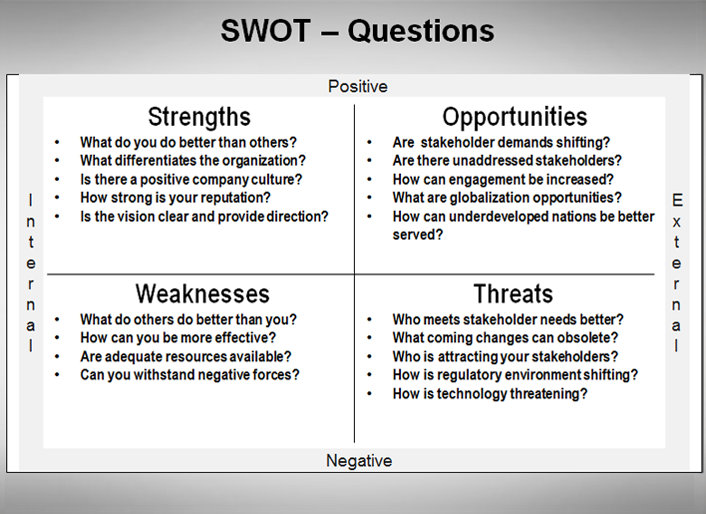 Below is the SWOT framework with associated questions to aid in generating comments. Contributors to this forum are encouraged to use the SWOT format, labeling Strengths, Weaknesses, Opportunities and Threats as defined above. In any case, those participating can make comments (in SWOT form) for any and each of the seven key areas described above. We appreciate your important contribution to ICANN’s 2012-2015 strategic planning process. As part of the strategic planning process each year, ICANN considers major internal and external events that have occurred since the last writing of the plan. The last plan was posted in December 2010 and approved in February 2011. This year’s approved Strategic Plan 2011-2014 [PDF, 3.37 MB] – posted after being adopted by the ICANN Board at the Silicon Valley Meeting – has incorporated strategic metrics based on extensive community input, review and public forums held in both Cartagena and Silicon Valley. The Strategic Plan informs the Operating Plan and Budget and helps to define ICANN’s yearly goals and priorities, and will be considered for adoption by the Board.